Warren Gamaliel Harding, born November 2, 1865, at Bloomington Grove, Ohio, died August 2, 1923, at San Francisco, California, was the 29th President of the United States. Harding was a Republican Senator from Ohio who was elected president in 1920 and served from 1921 until his untimely death in 1923. 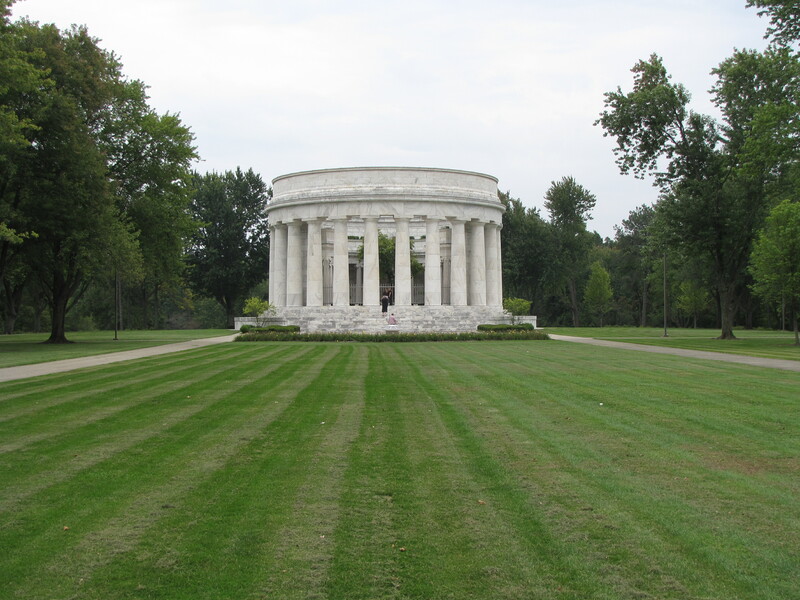 Even though, his short time in office was scandal ridden, the popularly-elected President Harding was honored with a lavish monument after his death. 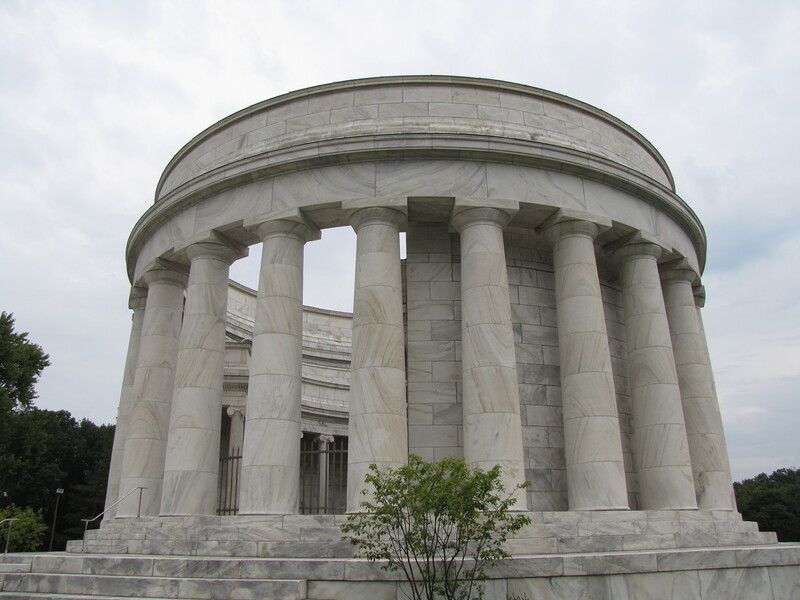 The tomb, landscaping, and grounds cost a whopping $783,108, raised by private donations, including pennies contributed by more than 200,000 school children. Harding wanted to be buried under the open sky. 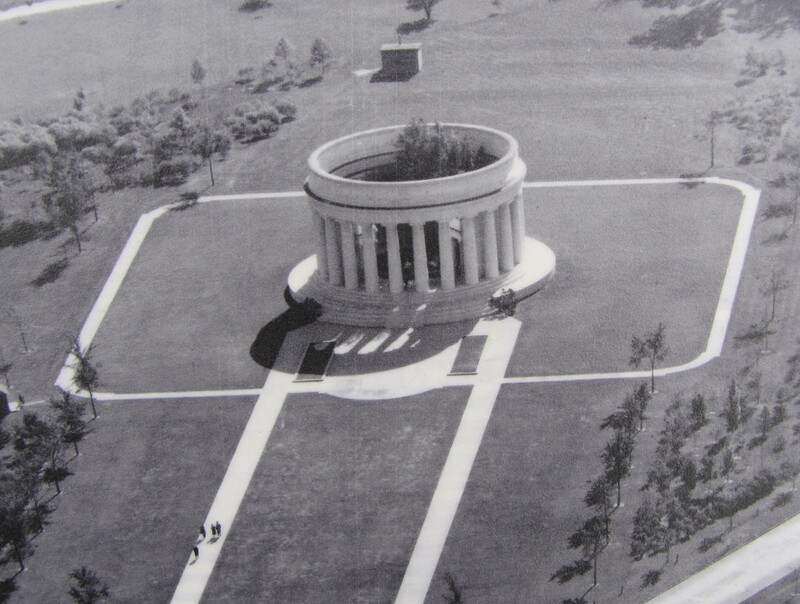 Architects Henry F. Hornbostel and Eric Fisher Wood fulfilled Harding’s wish by designing an open space to hold two black granite grave ledgers surrounded by a circular colonnade made of Georgia marble in the tradition of a Greek temple. According to the placard at the monument, “The exterior colonnade stands entirely free from the circular wall behind it, while the inner columns support two terraces for a hanging garden inside the structure. 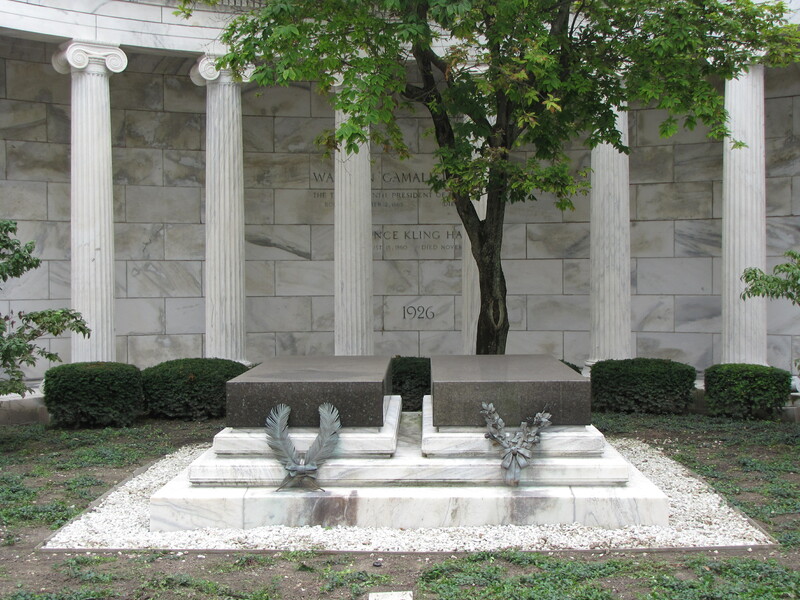 Two black tombstones, surrounded by a bed of ground-covering plants and shaded by a Japanese maple tree, mark the graves of President Harding, left, and Mrs. Harding, right…The 10-acre site’s landscaping is part of the overall design. Rows of trees form the shape of a Latin cross, with the tomb at the intersection of the arms.” The tomb is a soaring 53 feet high and 103 feet in diameter and represents the last of the monumental and large presidential tombs. Wow, Vanity thy name is Warren Gamaliel Harding!